Orange-red or green with black head and black spots. Adult beetles lay eggs in soil at the base of seedlings. The eggs hatch into larvae which feed underground on roots and stems, making stems weak and easily broken in wind or during picking, before they become adult beetles. Adults riddle leaves, especially on early bean plants. Super-Light Insect Barriers are very effective. Grub-Away Nematodes, applied at or shortly after lanting time, control larvae. 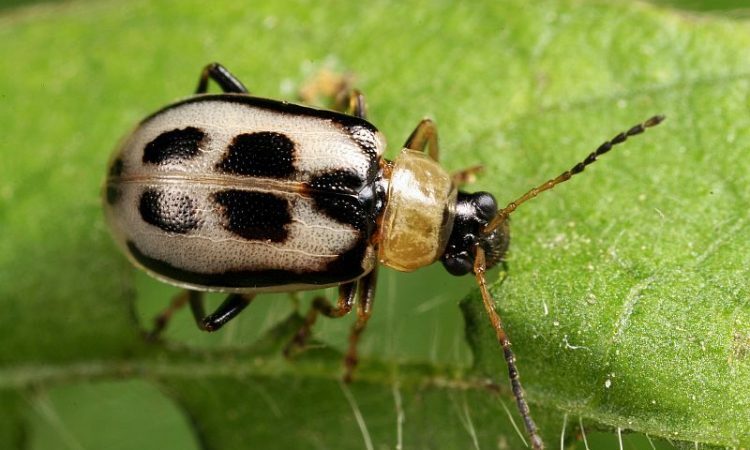 If it is already too late or if the beetles have flown in from surrounding areas, use PyolaTM Insecticidal Spray (at our test farm we found it more effective than rotenone) when damage first occurs; if damage continues at unacceptable levels, follow up weekly for 2 or 3 applications.